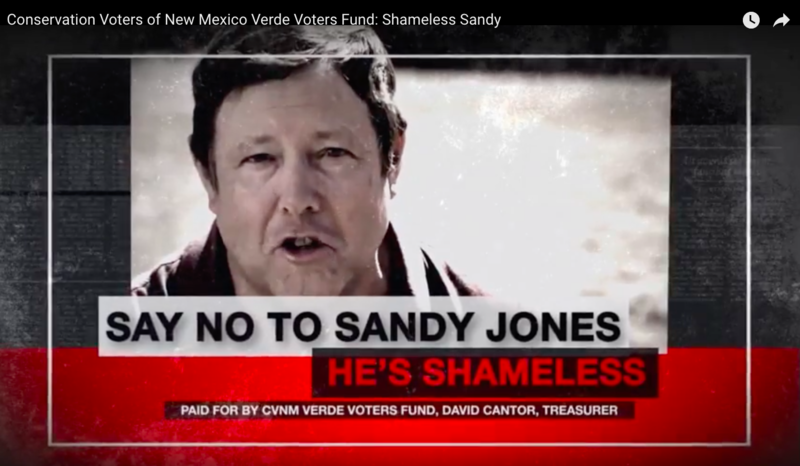 In this television ad, the CVNM Verde Voters nickname Sandy Jones as "Shameless Sandy". They criticize him for his decisions as Public Regulation Commissioner and for receiving an annual salary of $90,000, as well as making money from his construction company, Sandy Jones Contruction. CVNM Verde Voters Fund is the political action committee of Conservation Voters New Mexico. This group is labeled "dark" because their large contributions come from national nonprofits for whom donor information is unavailable. However, unlike many political action groups with undisclosed donors, the individual contributions to the Verde Voters Fund are disclosed and staff of CVNM are well known in New Mexico for their advocacy work.